LOS ANGELES, April 10, 2019 /PRNewswire/ -- Gemini Rosemont Commercial Real Estate, a leading real estate investment company with holdings of approximately eight million square feet of commercial office space, has relocated its corporate headquarters to Los Angeles. The strategic relocation of the company to the nation's second largest city favorably positions Gemini Rosemont to continue its aggressive investment strategy. The company has upwards of $250 million in equity ready to deploy. With the strong balance sheet of its partner, Gemini Investments Holdings, Ltd., an investment company listed on the Hong Kong Stock Exchange, Gemini Rosemont is actively pursuing the acquisition of Class A commercial office buildings in its target markets. "We're entering the next phase of our multi-pronged initiative to acquire Class A assets in the office sector in targeted, tech-centric coastal and gateway markets, and opportunistically in select target markets across the U.S.," said Ian Brownlow, Chief Executive Officer for Gemini Rosemont. "We will leverage our deep market knowledge and our impressive 27-year track record to identify and acquire those office buildings in which we can unlock value, provide superior tenant services and deliver enhanced returns to our investors." 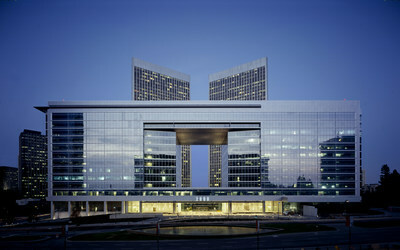 The company signed a long-term lease at 2000 Avenue of the Stars in the heart of Century City, Los Angeles' world-renowned business district. "Locating our corporate office in Los Angeles, one of the world's largest commercial real estate markets and a major transportation hub, provides us with greater access to U.S. and international industry partners and markets, and enables us to continue implementing our growth strategy," said Brownlow. "It also allows us to better serve our partner, Gemini Investments, and our domestic and international investors." The company has been headquartered in Santa Fe since its inception in 1992 and the Santa Fe office will continue to provide support services to the company's Los Angeles and regional offices. Gemini Rosemont Commercial Real Estate is a market leader in commercial real estate acquisition and asset management. The company and its affiliates' portfolios are comprised of approximately eight million square feet in 48 buildings in 14 states across the U.S. Since its inception, Gemini Rosemont has sponsored 170 investment vehicles, deployed over $805 million of investor equity to purchase more than $2.5 billion in assets, and has acquired and/or managed approximately 30 million square feet of commercial real estate. Through sponsorship from Gemini Investments Holdings, Ltd, an investment company listed on the Hong Kong Stock Exchange, the company has acquired approximately $400 million in Class A office buildings in technology-centric gateway markets representing nearly one million square feet since 2016. Founded in 1992, Gemini Rosemont employs 135 real estate and other professionals. Headquartered in Los Angeles, the company has regional offices located in Dallas, Denver, Houston, New York, Santa Fe, and Seattle-Bellevue. For more information, please visit GeminiRosemont.com, or contact Jon Dishell, Chief Business Development Officer, at JDishell@GeminiRosemont.com.